This sign is at N41 51.657 W80 56.214. 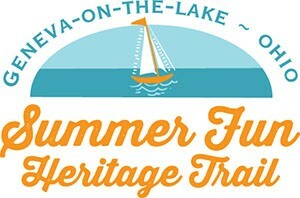 Township Park was the playground for the masses when the newly formed Village of Geneva-0n-the-Lake published a large brochure highlighting all that the village had to offer, including the wastewater treatment plant. Nearly a century later, the park is still a playground for families who come here to picnic, walk, watch the sunset, play games and hold family reunions. 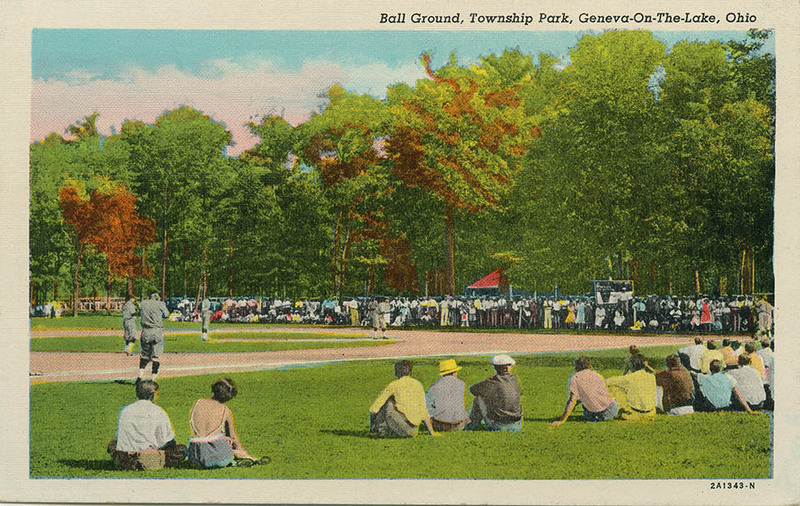 A ballgame at Township Park, 1938. Star Beacon archives. 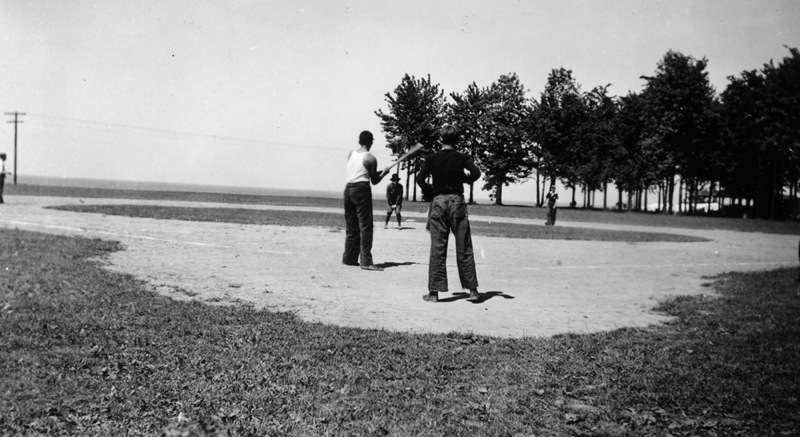 For many youngsters, the park’s most significant feature was its ball field. Postcards fro 70 to 80 years ago document the large crowds that gathered to watch the games at this field. Township Park was the pace the kids from “the lake” came to play in this park as far back as the 1800’s. The baseball field, through those trees, taught me some interesting lessons about play. Past the one-room school house and through the giant oak trees is the baseball field. It has been over 50 years since I played on that field, but today you can still see the worn patch of earth that we, and prior generations of kids from the lake, used as home plate. Beyond the outfield was a gradual, Queen Ann’s lace adorned hill that led way to the beach and the shore of Lake Erie. From home plate, looking beyond the outfield, one could see ore boats steaming to the Penny Docks to the east, sail boats tacking smartly with the afternoon west wind, and bobbing fishing boats anchored steadfast for perch. A homerun from this place was any ball that went over the lakeside footpath and rolled down the hill to the lake. Corky Korver was the only one that I knew who ever hit a ball into Lake Erie from home plate. It was a jaw dropping blast. As we scrambled down the hill we saw the only ball we had that day drift out into the lake and float east towards Ashtabula. For me, growing up in the early 1960’s, summer was one long continuous baseball game. I learned early on that it didn’t take a lot of players to make a good baseball team. Five young boys, plus Vickie Allen, could make a game work. What mattered most was a desire to play….a love of the game. I did not know at that time what the word passion meant, but I came to know what it felt like when we played well past dusk, seven days a week beyond summer and into early autumn. Passion was a love of something. I came to know passion by playing on a ball field and I carried that feeling with me years later to something called teaching. Playing baseball in this park also taught me something about imagination. On any given day on this field the Bodnar twins, Paul and Mike (whose family owned and ran the Hungarian Restaurant just down the street during the summer), could be Yankee sluggers named Mickey Mantle, or Roger Maris. I was an aging Cleveland Indian hero named Rocky Colavito. Sandy Koufax, the Perry brothers, and Bob Feller, who was well past his playing years, could be reincarnated in the form of John Wood (Woodie), Paul Welker, Todd Nichols, Jimmy McGraw, or the Hogan boys. We imagined the park as being Cleveland Municipal Stadium and the park benches as the bleachers. The old and young alike, who walked the lakeside path, became our fans. Imagination was a powerful tool that transformed Township Park into our own “field of Lake Erie dreams”. As I became older, I grew to understand that imagination fades, play takes a back seat to responsibility, and our baseball heroes, who were no longer needed on the field of dreams, were encased in attic bound shoe boxes, their images and statistics preserved for eternity onto dog eared cards that were wrapped tightly with twine and scented faintly with eau’ de bubble gum. Estate of Joseph Battell sells 3/4 acre to the Board of Education for Geneva Township. Land is to be used for a school house lot. Board of Education of Geneva Township sells 3/4 of acre to Board of Park Commissioners for $800. Board of Park Commissioners purchases land that surrounds the school lot. Sale is for 9.86 acres for $5,000. And picnics, providing folks behaved themselves. 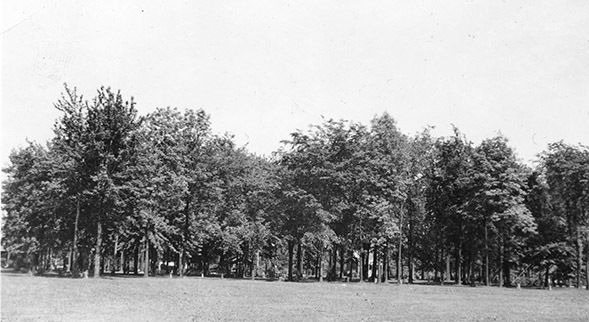 The road was moved from the north side of the park to the south and plans were announced for a pavilion to be built the following year. 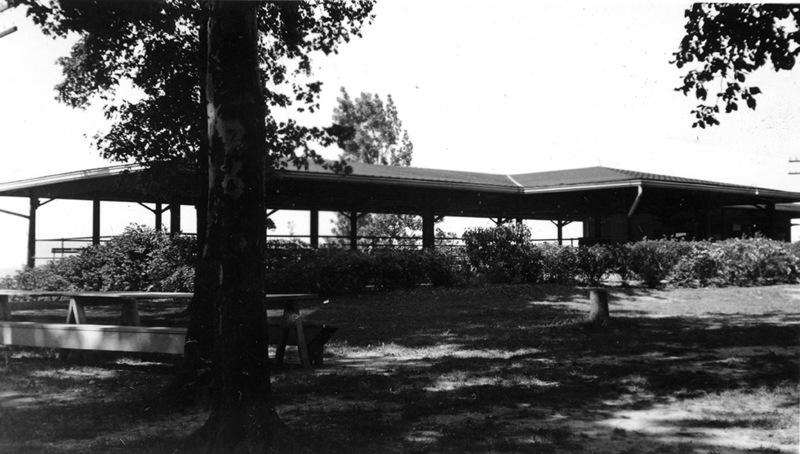 A 1938 photo of the pavilion helps date this important amenity of the park. Star Beacon archives.